Check out MMA News' live coverage of UFC on ESPN+ 2 from the Centro de Formação Olímpica do Nordeste in Fortaleza, Brazil. 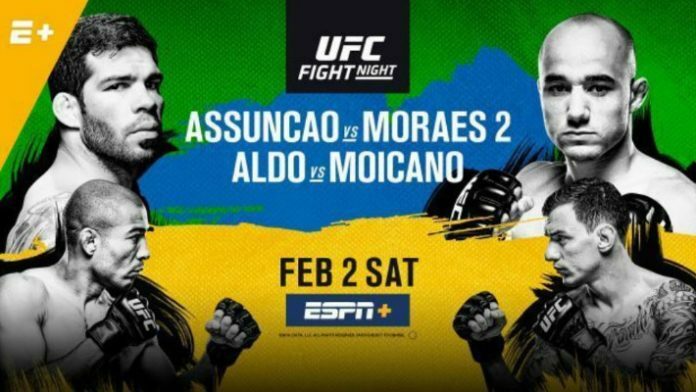 UFC on ESPN+ 2 went down from the Centro de Formação Olímpica do Nordeste in Fortaleza, Brazil earlier tonight (Sat. February 2, 2019). The worldwide leader in mixed martial arts (MMA) had put together a great card for the Brazilian crowd. In the main event, bantamweights and fellow countrymen Marlon Moraes and Raphael Assuncao went head-to-head. Spinning back kick from Assuncao is just blocked, but a low kick almost trips up Moraes. A big couple of right hands land for Moraes and Assuncao is dropped to his back, right into Assuncao’s full guard. Moraes passes into half guard for a moment, but is back into full guard. Moraes postures up for a few seconds and lands some nasty ground-and-pound. Moraes pulls guard for the guillotine and lands in a mounted choke. The pressure is too much for Assuncao, and he’s forced to tap out.